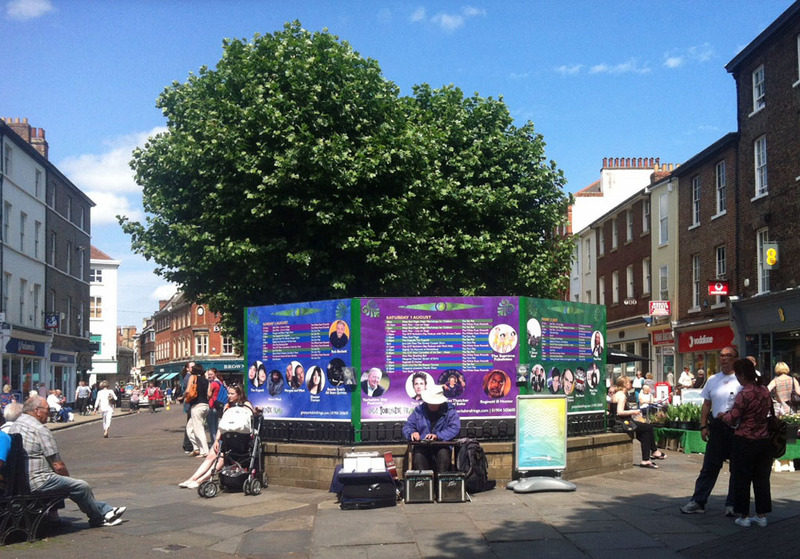 The disused fountain on Parliament Street, having for many years served as a useful seat and meeting point, is now serving another purpose, as a support for advertisements for a forthcoming event. On a previous page, prompted by Press reports, we were wondering what the story was regarding the fountain in Parliament Street and who ‘Make it York’ are, and how it is that they appear to be deciding on the destruction of the structure on behalf of the city’s residents. Steve Brown, managing director of Make It York said:”We wish to clarify that any decisions which impact on the fabric or infrastructure of the city centre are the responsibility of City of York Council. However, as the company leading on marketing York, we will contribute our opinion on matters which we feel impact on the city’s attractiveness as a place to live, visit, study and do business. The Press also did an opinion piece on 13 July on the subject, perhaps hoping to provoke more comment. The piece seemed to suggest that we should leave Make it York to make decisions about the city centre. The broader issue here is about the role of Make It York. Will every substantial decision on the city centre in future be taken by the city council? And if so, what was the point of setting up Make It York in the first place? Yes, that is indeed part of the broader issue, as highlighted on these pages a few days earlier. Surely every substantial decision on the city centre should be taken by the city council? Because they’re elected and answerable to us, and we can usually read the agendas and minutes of their meetings? Hard to imagine how it could be otherwise, in the light of increasing citizen involvement, the ‘Localism’ agenda and changes in approaches to governance and transparency. It’s not the 1950s. The Press coverage provoked some interesting and amusing comments and readers’ letters. In response to the oft-quoted fact that the fountain is an established meeting point in the city centre, one person suggested we could get rid of it and put a large sign saying ‘Meeting Point’ in its place. Another reader wanted a statue of Richard III. On the subject of statues and fountains, let’s dash across the city to another fountain, overlooked by a familiar figure. Yes, it’s dear old grubby Etty! But he’s not grubby anymore. He’s all sparkling white. This apparently happened a week ago and was captured on camera by Keith Myers, @York_Today on Twitter. Poor Etty, being blasted with water. I thought he looked a bit wide-eyed and startled. 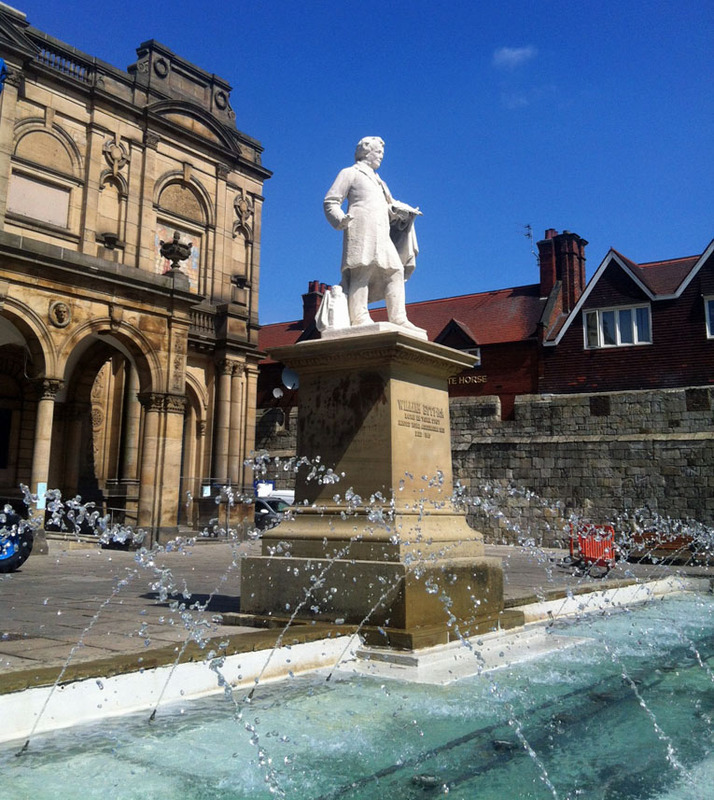 Etty overlooks the fountain in Exhibition Square, which unlike the Parliament Street example is actually a working fountain with water jets playing gaily across a pool of water. But it was eating Etty, and there was talk about removing one or the other of them, as discussed on this site some time back. At the time, Reinvigorate York did a consultation on changes here in Exhibition Square, and some of those took place, so it now has new paving and bus stops. I wondered if there was going to be a stage 2, involving the removal of Etty or the fountain, but it seems that we’ve settled for cleaning him up. Perhaps the fountain will be filled in instead. I hope that any decisions on this will be publicised and made by elected officials in a transparent and open way. 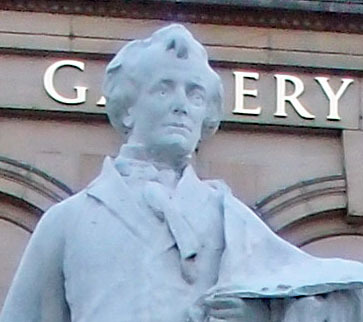 I’m not a big fan of statues, but over the years I’ve developed a fondness for Etty on his plinth. And he needs to stay here, in this particular place, his eyes forever fixed on Bootham Bar, that’s an important part of the story of this statue. With all your improvements, patching, and cobbling, you can never make York a uniform, “well-built” City. But keep her Antiquities, and she will always possess a charm, an interest, far beyond that of most other towns, however regular their streets or “handsome” their houses.